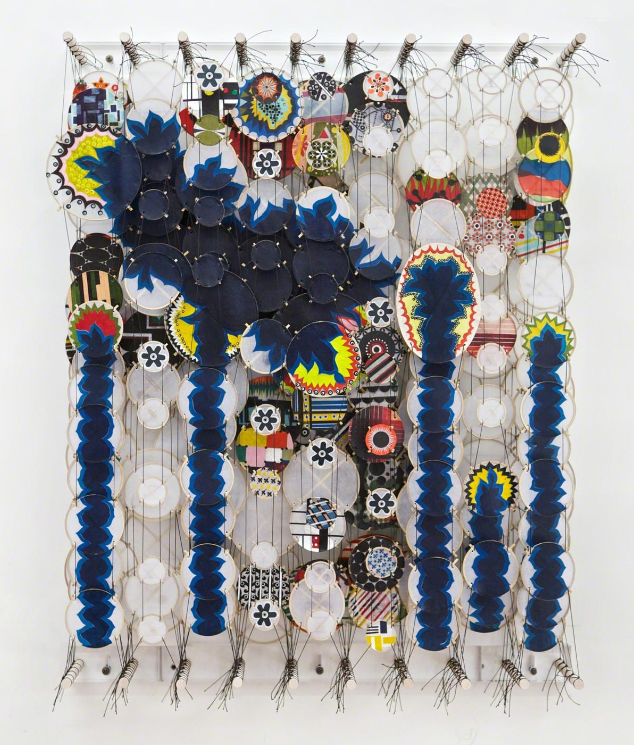 Jacob Hashimoto is on a slew of favorites lists for The Armory Show, which celebrates its 100th anniversary this year. The Colorado-born, New York artist uses traditional Japanese methods to create large-scale “tapestries” out of thousands of pieces of hand crafted paper and wood. Each work is comprised of hundreds of small bamboo and paper kite-like elements strung together in chains. Then layers of these chains are stretched between short dowels that project from wall-mounted brackets. A selection of his works on Artsy, here. Gorgeous Art!, fun colourful with hidden layers ready to discover as you look closer. Some of them look like landscapes. I wish I could see the technique more closely!